A must have for the gun enthusiast! The Compact Ammo Picker Upper by Ammo Up is a compact, lightweight, handheld Ammo Picker Upper that is effective and affordable. 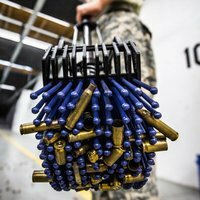 No more bending over to pick up your spent ammo and no left over mess from what you missed. Lightly push the Compact Picker Upper over the spent ammo and watch as the magic finger technology "grabs" the spent ammo. It doesn't release until you engage the easy-to-use handle release. How simple! How smart! Use the Ammo Picker Upper on surfaces such as concrete, carpet, dirt, sand and even up to 4" tall grass! Try the Ammo-Up Compact Picker Upper and rest easy with a 30 day money back guarantee and a one year manufacturer's warranty. The Compact Ammo Up Ammo Picker Upper offers interchangeable heads. See our Swap Out Kit to maximize your Picker Upper and switch between Shotgun/Brass Picker Uppers!